LG Telecom, Korea’s smallest mobile operator, took the wraps off that nation’s first waterproof mobile phone, the canU 502S [.jpg], developed under alliance with Japanese firm Casio Computer. 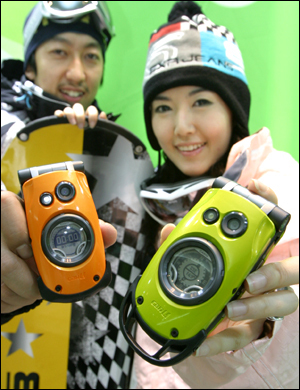 Launched in Japan in May 2005, the G’zOne is a rugged, water-and-shock resistant handset based on the company’s popular G-Shock wristwatch series. The unit has four styles of digital time keeping and a sub-display screen that functions as an electronic compass. The Korean version also comes with an MP3 player and a mega-pixel camera and has a price tag of 550,000 won. The Japanese version was labelled as “water resistant,” so submerge for 30 minutes at your own risk! — Ed. previous post: DoCoMo Makes Move in Korea :: next post: Finally a Samsung Phone for Japan?